I came to realize that when dining at a restaurant in Costa Rica, it really would be helpful if I knew more Spanish. When we went out for meals, which we often did as a group, it was easier when we needed help because we had our professors who spoke Spanish very well. But when we got the opportunity to go out without them, it was unconsciously decided that we would pick a place we thought would know more English, to make it easier on us and the waiter. When going out to eat, there were always lots of options, just like in the United States. There was a typical burger and fries, chicken tenders, or salad to choose from as comfort food. But there were also many other options to choose from that were different and delicious. 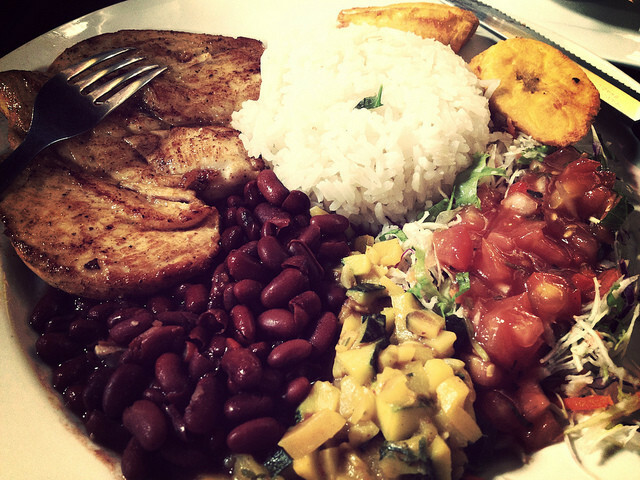 Still, no matter what meal was ordered, it almost always came with a side of rice, beans, and plantains. Food at home was almost the same every day. When we woke up in the morning, breakfast was always ready for us on the counter, thanks to Maria Marta. Breakfast included fruit, toast, coffee, juice, and sometimes meat and cheese. A healthy, light meal to get the day started, and dinner usually included some type of meat with rice, a vegetable and salad. We ate dinner together as a family every night, no matter what time it was. Dinner wasn’t made until everyone was home to eat. I really enjoyed this because at the end of a long day, we were able to eat together and talk as a family. Often times, we ate outside which required bringing things such as the food and dishware out to the table. Along with me and some other students staying at Maria Marta’s house, Danielle and Marco were always willing to help so things went much quicker and smoother. If there was one thing I learned about the food and dining in Costa Rica, it is to never underestimate the proportions and quality of the food, no matter where you go.